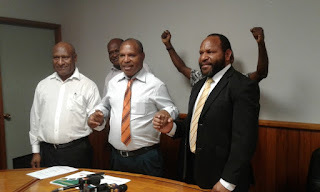 The dismissal of the petition will allow the member to carry out his mandated duty as the duly elected leader for Yangoru Sausia to bring in services and development freely. “I am absolutely relieved today that the petition against me by the former member and my rival in two elections Peter Wararu was dismissed today by the Supreme Court,” said Mr. Maru. The Supreme Court this morning dismissed a leave application for review which means that the case is now over and Mr. Maru’s election cannot and will not be challenged further in any court of law. “I am free now and able to concentrate my attention on my job as National Planning Minister and also as member for Yangoru Sausia and I can focus on delivering goods and services to my people in the district and offcourse throughout the nation.” said Maru. Lawyer representing Mr. Maru, Paul Mawa said the petition basically challenged MP Richard Maru’s return on 3 grounds including bribery, illegal practice and errors and omissions but was unsuccessful and dismissed by the National Court. Petitioner Mr. Waranaka, aggrieved by the decision filed an application for leave in the National Court trying the challenge the decision of the National Court.